Best of all, you don't need a dehydrator, although that would be nice, you can make this in your home oven. In a large bowl, thoroughly combine ground beef or ground turkey, onion powder, garlic powder, hot pepper sauce, Worcestershire sauce, soy sauce, ketchup, and salt. Cover bowl and refrigerate ground beef or turkey for 4 hours until well-chilled. Place ground meat mixture by the tablespoon in between pieces of plastic wrap. Use a rolling pin to flatten into rounds less than 1/8-inch thick and dry using one of the two following methods. Place the meat rounds on dehydrator trays to dry following the manufacturer's directions. 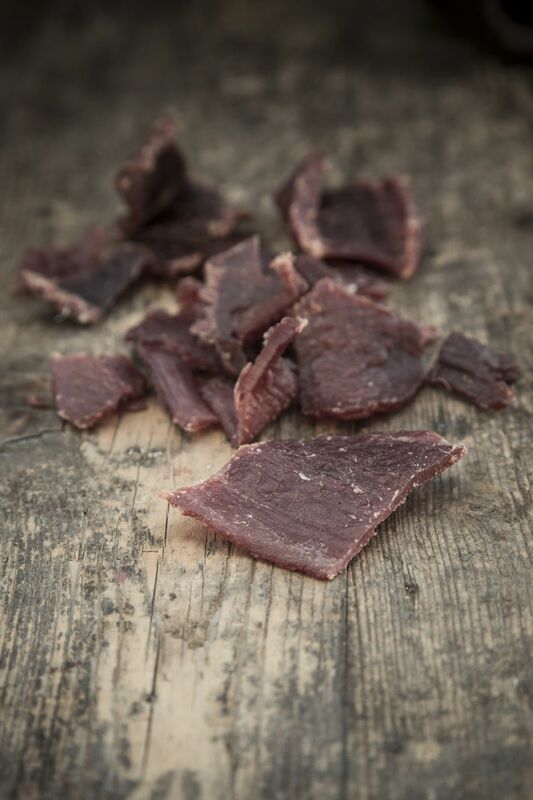 Turn jerky strips once midway during the drying process. Be aware that home-oven jerky making takes three times longer than in a dehydrator because there is no fan blowing over the strips of meat to help dry it out. Heat the oven to the lowest possible heat setting (145 F to 155 F). Place the meat rounds on a rimmed sheet pan and dry, flipping once until they are still pliable but not still dripping with moisture. Be sure jerky is completely cooled before storing. Blot away any moisture or oil that has risen to the surface. Place in zip-top bags, vacuum bags or other airtight container and store in the refrigerator or freezer. See additional tips below. Ground meats present the greatest danger in terms of foodborne illness because grinding distributes any pathogens present on the meat surface. The jerky must be heated enough to destroy any harmful microorganisms present and it must be shelf stable and storable at room temperature. Researchers say three ways to achieve this is by post-drying heating, precooking the meat and vinegar soaking. The only real technique that would work well with ground meat is the post-drying method. Heat oven to 275 F. Place dried meat strips on a cookie sheet and cook for 10 minutes. Heat strips of raw meat in hot brine (salt water) until meat registers 160 F for beef and 165 F for poultry or bake it to the same internal temperature as for brining. Marinate meat strips in vinegar before drying. This technique might flavor to the product, however.